School Success is looking for a copywriter to write blog articles, different whitepapers and other ressources for parents in education. You can take a look at what we did for the french part of our business here. Your role will be to write texts on a variety of subjects, all related to the world of education in general and the activities of the company. Please note that this is not a job, we are looking for an independent contractor. You’ve probably heard it before: the RESP is an investment that pays off! Why? Because it’s the only financial product eligible for generous education savings grants from the government. In Quebec, children are even entitled to grant money from both the federal and provincial government bodies! Based on your family income, these grants could top up your RESP contributions by 20% to 60%! Are you making regular contributions to your RESP? That’s a great start! Each contribution you make attracts grants, which are then paid into your plan. And you don’t have to worry about applying for grants; your RESP promoter does it for you. At Universitas Financial, a team of education savings experts takes care of the application process and ensures beneficiaries receive every penny they are entitled to in grant money. So you can rest easy! The magic number is $2,500. This is the maximum contribution amount eligible for grants annually. So if your family budget allows it, this is the sum you should invest to attract the maximum grant amount each year. You can choose to make a single payment or, like many parents and grandparents, opt for monthly contributions to make it easier on your family budget. New parents often have to juggle with a multitude of extra expenses and lower sources of income due to parental leaves. Once the family budget recovers some stability and a little extra is left at the end of the month, it’s good to consider catching up on unused grants. This brings us to our second magic number: $5,000.2 This is the maximum contribution amount that attracts grants if you have unused grant room from previous years. You always have the possibility of adding to your RESP. So using a tax refund or an unexpected bonus is always a good strategy to boost your RESP and get closer to the magic $2,500! Moreover, a increasing number of grandparents, uncles, aunts and relatives choose to offer RESP contributions for a child’s birthday or as a Christmas present. This alternative is truly an investment in the child’s future… and a gift that will grow over time! Your teen turned 14 years old and you’re starting to anticipate the cost of post-secondary education? You might have thought about increasing your RESP contributions to maximize the government grants received, but when you’re on a tight budget, it’s easier said than done. In this case, you might consider the RESP Loan offered by Universitas; a simple solution with considerable benefits! By taking a loan with one of Universitas Financial’s industry-leading partners, you’ll have all the assets needed to invest in your RESP. The loan’s interest is the only payment to cover, which is a great deal since the hefty grant sums the loan will attract outstrip the interest by far. It’s a winning strategy! And once you plan reaches maturity, the loan is automatically reimbursed to the lending institution. The key is to always remember your RESP when you have a little extra money and are wondering which investment or project to prioritize. When it comes to the RESP, even the smallest contribution can go a very long way! *In provinces where there is a provincial incentive. The Canada Education Savings Grant (CESG) rate is 20% to 40% and yhe Quebec Education Savings Incentive (QESI) rate is 10% to 20%, based on adjusted family net income. Certain conditions apply; see our prospectus at universitas.ca. Certain restrictions may apply; see our prospectus at universitas.ca. A number of factors influence school success: effort, parent involvement, healthy living, diet, sleep, etc. That being said, according to the Universitas Barometer, an annual survey of Quebecers’ savings habits, the ability to pay for school-related expenses is one of the most common challenges reported by parents and students when it comes to the pursuit of a post-secondary education. 62% of the respondents aged 18 to 24 view the Registered Education Savings Plan (RESP) as a key element in their motivation to pursue a post-secondary education. Several graduates who benefited from RESPs opened by their parents confirm this: simply knowing this plan was available to them led them to pursue a higher education or to persevere during their school career. Furthermore, as the RESP provides funds for a wide array of eligible school programs, both domestic and abroad, it constitutes a flexible investment that allows students to pursue an education that is truly in line with their interests and aspirations. More than one-third of the young people surveyed reported they did not pursue a post-secondary education for financial reasons. The costs associated with post-secondary education remain a major concern for young Quebecers and represent one of the most important roadblocks to higher education. However, students who receive RESP payments or financial assistance from their parents are generally less concerned money-wise than those who have to fend for themselves. 54% of students work part-time jobs to pay for their education, often in addition to another source of financial aid. That means more than half of students have to work while pursuing their education. Although a summer or part-time job allows them to make their debut on the labor market, a demanding work schedule during the school semester could jeopardize their academic performance. Students with an RESP can focus all their energy and attention on their education. Each dollar invested in an RESP attracts 30% to 60% in grant money. By introducing generous education savings grants, the Government of Canada and the Government of Quebec wished to promote access to education for all. In addition, thanks to the Canada Learning Bond―offered to families with several children or of more modest means―it’s possible to receive an extra $2,000 per child! With Universitas, eligible families can start to receive the CLB as soon as they open an RESP, with no obligation to make contributions. Certain conditions apply. See our prospectus (lien) for the list of eligible studies. When you think about the holidays, gifts usually spring to mind; and this year, your children’s holiday cards might include a few dollar bills in spending money. Depending on how old they are, their reaction may vary: while the younger ones might not quite grasp the actual worth of these pieces of paper, older kids ill likely burst with delight at their sight. Nevertheless, during this time of abundance, many parents still want to teach their children healthy, responsible spending habits. Here are a few ideas on how to put these gifts to good use. How about a bank deposit or a brand new account! By encouraging your children to deposit their money into bank account, your introducing your them to the idea of saving. However, they might not agree to this more rational option: seize this opportunity to teach them that although it’s nice to treat yourself from time to time, saving is also key to developing good financial habits. If you get some cash for the kids, get the most out of this gift but putting some of it into a registered education savings plan (RESP). Not only will this money attract government grants , it will also grow tax-free until they reach post-secondary education! Are you trying to stay away from stores? More and more parents would rather spend money on an “experience” than material goods. Of course, you should go for something in line with your kid’s interests, but with all the options available, you have your pick of activities: a day at a themed park, a visit to the aquarium, skiing, going to a show, rock climbing, getting tickets to a hockey game, etc. Young readers will always be thrilled to go to the library or a store that sells used books; their shelves are full of hidden gems waiting to be discovered! You could also get them a subscription to their favourite magazines so they can have a surprise waiting for them in the mail every month. Horseback riding, hip hop dancing, drawing, programming, acting, gymnastics… Nowadays, children of all ages can choose from a wide variety of hobbies, sports or a classes! Maybe they could use that extra money to try out a new hobby? In the end, what truly matters is getting your kids to reflect on the options available to them instead of making an impulsive spend. Thinking before spending is a great habit to develop all year round, not just after the holidays! As parents, we always want what’s best for our children. From an early age, we size up their personality and see them paint a self portrait through role-play, whether that of an actor, teacher, doctor, fireman or designer. However, along the road a number of events can create obstacles to their ambitions and dreams, such as learning difficulties, giftedness, illness, family background, and so forth. But who would have thought that the cost of education would be a genuine roadblock to the self-fulfillment of today’s youth? According to the first edition of the Universitas Barometer, a tool released by education savings pioneer Universitas Financial to provide economic indicators regarding post-secondary education, 32% of young people said the high costs of education had compelled them to abandon their academic ambitions. This means one out of three students will not pursue their education for financial reasons. Surprising? Yes, and no. Yes, given that in an ideal world, money should not be an obstacle to the pursuit of knowledge and education. However, when we see education costs increase from one year to the next, it’s better to be prepared as the bill to cover these may be steep for many families, particularly in the case of students who will have leave their home and pay for housing during their studies. Cost to complete two years of CEGEP and three years of University in Quebec. Based on a 1.7% yearly increase. Sources: Ministère de l’Éducation et de l’enseignement supérieur, Ministère de la Famille, Statistics Canada, Canada Mortgage and Housing Corporation (CMHC). The Barometer also found that over three quarters (77%) of parents are concerned with the costs of post-secondary education. Luckily, there are options to plan ahead and help our children pursue their education without incurring too much debt. The registered education savings plan (RESP), for example, is a type of investment specifically designed to save for post-secondary education. The main advantages of the RESP are the substantial government grants that supplement RESP savings and the investment’s tax-free growth. To learn how much an RESP could earn for you, try out our calculator and do the math online. This will give you an idea of how much you could receive to help put your children through school and without the burden of a hefty student debt! Want to save the world one essay at a time? Have you explained algebra to all your neighborhood kids? Then you are most probably the person we are looking for! School Success is a young and dynamic network of over 800 tutors. Our mission is to help students understand various subjects, as well as increase their self-esteem and their motivation towards their studies. Have you ever felt the Aha! moment while trying to understand something? Imagine helping elementary and high school students feel the same way! Moreover, teaching is a skill you will most likely need in the corporate world. Because no one learns the same way, a tutor must be able to adapt to each student. We have students in every part of the Greater Montreal, whether it’s in Westmount, Terrebonne, West-Island, or Greenfield Park. Wait? You’re telling me I get to make a difference in a kid’s life and enjoy a flexible work schedule? School Success tutors are independent workers, offering you flexibility and control over your schedule. This means you can coordinate your tutoring schedule with your other jobs and/or your university schedule. You will be able to work according to your availabilitiy! What does School Success do for you? We take care of all the administrative tasks, the sales, the negotiations and the billing. Basically everything up until your first meeting with your student. We’ll make sure your schedule and your travel time to each appointment make sense. In exchange, we ask you to keep a steady follow up with your students as well as their parents. Interested in becoming part of the School Success network? Apply by opening an account! It’s common knowledge that the cost of education is constantly on the rise. But what does that represent exactly? Well, while it currently costs approximately $100,000* to complete two years of CEGEP and three years of University in the province of Quebec, projections show that this sum will rise to a little over $138,000* for the same education in 2035. So how are parents to tackle this problem? How can they ensure they have the funds to help pay for their children’s education, allowing them to graduate and get off to a good start with minimum student debt? The answer is simple: by investing in a registered education savings plan or RESP. This savings vehicle allows you to save for post-secondary education and is the only financial product eligible for substantial government grants that top up your contributions, up to $12,800** per child. So when should parents start saving? An early investment is always the best course of action since you save and receive grant money over a longer period, which means more investment growth. That being said, it’s never too late to start saving! If you want to know how much you could save with an RESP if you start contributing now for your child today, we’ve got you covered! Try out Universitas Financial’s online RESP calculator! With over 50 years of expertise, this RESP industry leader offers a tool that shows you just how far $20 (or more) a month can go. 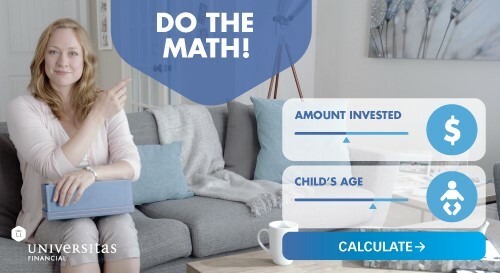 Do the math and see for yourself what your investment could be worth! Remember that regardless of the amount you invest, the day your children are ready to begin their studies, they will be grateful that you took a proactive step to help them pursue their dreams. *Cost to complete two years of CEGEP and three years of university in Quebec, housing included. Yearly increase of 1.7%. Sources: Ministère de l’Éducation, du Loisir et du Sport, Ministère de la Famille du Québec, Statistics Canada and CMHC. ** Canada Education Savings Grant (CESG) of 20% to 40% and Quebec Education Savings Incentive (QESI) of 10% to 20%, based on adjusted family net income. The annual CESG limit is set at $600 and the lifetime limit is set at $7,200 per child. The annual QESI limit is set at $300 and the lifetime limit is set at $3,600 per child. CLB: Canada Learning Bond of up to $2,000 per beneficiary, for children born after December 31, 2003, for whom the family receives the National Child Benefit Supplement. Certain conditions apply. Refer to the prospectus at universitas.ca. With the various means of communication available nowadays, it’s not surprising that children dream of studying in far-off corners of the world. With the world at their fingertips and the desire for adventure, many see their post-secondary education as an opportunity to open the door to new cultures. So ask yourself, do your kids have the travel bug? Maybe they already see themselves pursuing their dreams abroad. With a little planning, you can help them in this grand endeavour. Obviously, planning this trip won’t happen overnight. First, the best thing to do is to ask your kids about their dreams and ambitions. Who knows, the perspective of studying abroad might even motivate your child to work extra hard in school. Help your kids set their goals and understand the different steps to undergo to pursue their dreams and achieve these goals. While an education in Canada is already quite the investment, it pales in comparison to the cost of international studies. In addition to tuition fees, your child will also have several other education-related expenses, such as those for transportation and housing. Furthermore, expenses will vary from year to year depending on the exchange rate for the Canadian dollar. A great solution is to set up a registered education savings plan. This savings vehicle entitles children to government grants and provides educational assistance payments to help fund their education in foreign institutions, provided these are recognized by the Ministère de l’Éducation et de l’Enseignement supérieur du Québec. Depending on the educational program chosen, your son or daughter may be eligible for scholarships or mobility awards to help pay for this project. Apply for all the grants out there to maximize chances of financial aid. Some scholarships are even offered to students pursuing vocational training, while others are exclusive to university students. Moreover, keep in mind that students who wish to complete student projects or internships abroad may also be eligible to receive loans. Many educational institutions in Quebec have already taken part in student exchange programs or granted advanced standing. As these schools are already familiar with the procedure to study abroad, they represent a great resource when it comes to learning all the necessary requirements for an international education and which options are available to students. You’ll be better prepared to plan for that first semester abroad and understand all the specifics involved. Before things are set in stone, make sure your children’s classes will be recognized by his or her current school. Also, some Quebec institutions have entered into cooperation agreements with other abroad schools, meaning that the student could pay the Quebec tuition fees even if he or she studies abroad. More often than not, tuition fees are much higher when studying outside the province or country. As soon as the decision’s been made, start organizing your child’s stay. Some legal procedures might take longer than you think so don’t wait until the last minute to apply! All the necessary documents should be ready before the big day (passport, visa, study permit, vaccines, proof of insurance, etc.). To find out exactly what documentation you need, contact the embassy or consulate in Canada of the country where your child plans to study. Furthermore, you may also want to learn more about the housing possibilities available. Dorms often involve long waiting lists and renting an apartment from afar can prove to be a complicated task. Go over all options and ask for references before entering into an agreement which might be hard to get out of. The holiday rush is at our doorstep and time is becoming a precious commodity. To avoid overcrowded malls and get shopping done faster, people are turning to other alternatives, like online shopping or going for gift-cards. The registered education savings plan (RESP) for a child’s future education also makes for a meaningful gift that is easily ordered and delivered. There’s only one pet peeve: the RESP doesn’t come in a gift box for the child to unwrap! Unfortunately, this minor setback has stopped numerous families from offering the RESP as gift… causing many children to miss out on the generous government grants offered for education savings. A Gift for Mom and Dad! You know that right now, your child isn’t pondering over his or her college applications; this toddler wants to rip at shiny paper and find hidden treasure. However, you can bet mom and dad have given thought to this future financial burden, and that the RESP will certainly have the WOW factor in their eyes. They are the ones who will genuinely appreciate the value of such a gift and the motivation it will likely provide for their child, encouraging his or her academic perseverance. A CROP survey commissioned by Universitas confirmed the RESP is indeed a gift parents would like to receive, with nearly 75% of the respondents saying they would be enthusiastic about the idea of a family member investing in an RESP for their child on a special occasion. This trend is most significant among parents aged 18-34 years (79%). If you’re still hesitant about the idea of the RESP as a Christmas or birthday gift when the child’s expectations are at their peak, there are countless other occasions to offer this present: a baby shower, new birth, baptism, early birthdays (when baby isn’t doing any unwrapping), the child’s school debut, the first report card and the list goes on! If you want to make the RESP as interesting for the child as it is for the parents, you could offer it with something symbolic for the child to unwrap. A subscription to a children’s magazine could be an appropriate side gift to encourage both education and reading, or a piggy bank to initiate your child to financial literacy and the importance of savings. In sum, children grow up fast and the RESP makes sure your savings grow with them! The government grants your child is entitled to make the RESP one of the best investments out there, so it’s worth being creative and finding occasions to offer it! For more information on RESP gift certificates available with Universitas, click here!